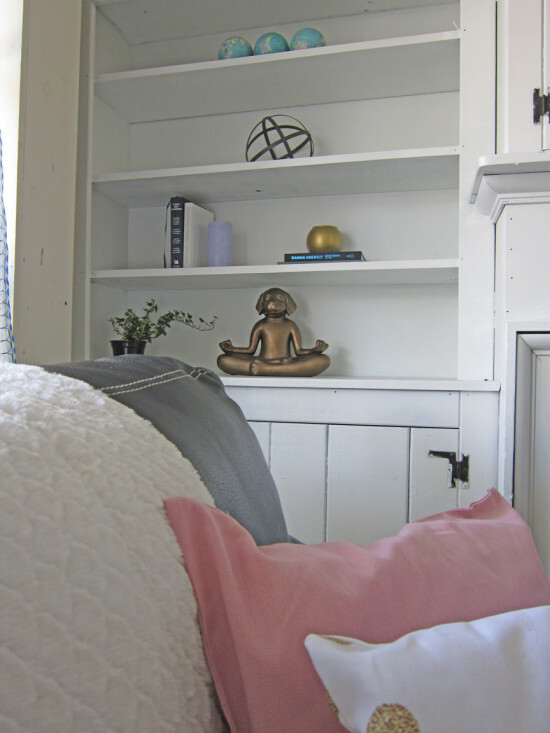 One Room Challenge – The Reveal! For the past six weeks I have been a one-woman, house-crashing show! It’s been so much fun and I couldn’t be happier with the results! Before I get to the details we have to go straight to the before and after! Remember how dark it was before? It is so much lighter and brighter now! If you are reading this for the first time, this house is an off-campus college house that my daughter shares with three other roommates. Taking that into account, I certainly didn’t want to spend a lot on this makeover since they will only be here for another year and a half or so. I really did this on a shoestring budget! First I painted this dark wall. That was a tremendous improvement on its own. I used Sherwin-Williams Pro-Classic paint in Bright White after priming. 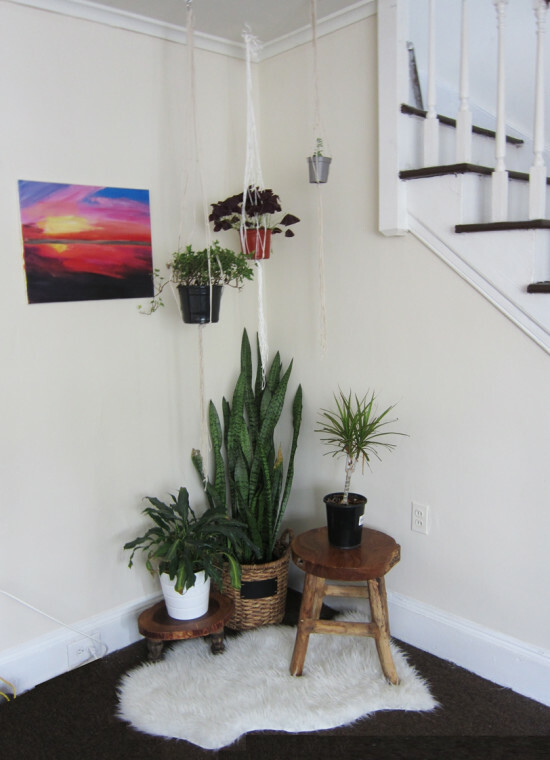 You can read the step by step on how to paint original woodwork here . Thanks again to Sherwin-Williams for sponsoring the paint for this makeover!! Filling the fireplace with books was the next step. That idea came to me when one of my daughter’s roommates adopted a cat, and the girls were having trouble keeping him out of the fireplace. I just love how this looks! Luckily, the girls already had the sofas. They were given to my daughter by my friend when she purchased a new set. 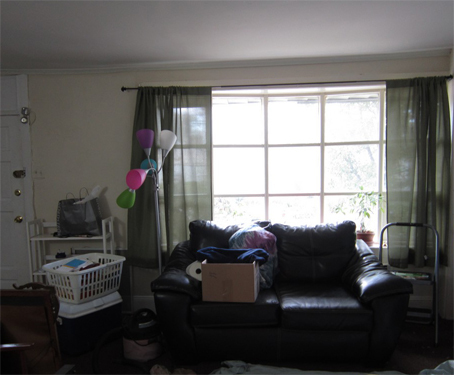 The sofas were pushed up against the walls, not doing anything for the floor plan. And the black leather just added to the overall darkness with the wood wall and brown carpeting. I never took any measurements and was slightly nervous that the layout wouldn’t work, but luckily it worked out just perfectly! 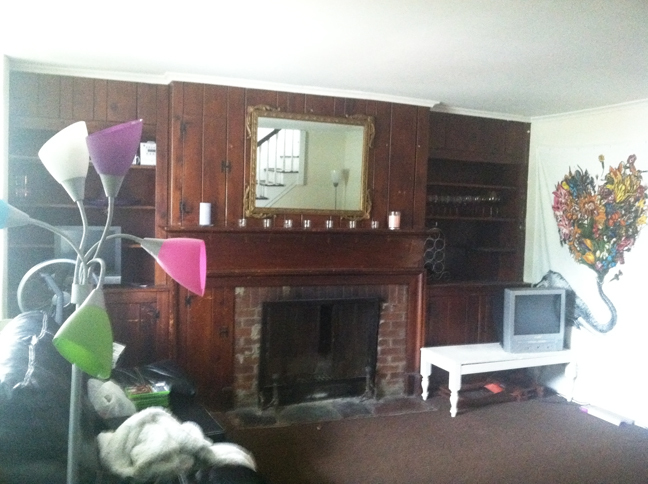 I pulled them away from the walls, and then added the coffee table that was also already in the space. This layout is much more conducive for conversation and hanging out for the girls. The elephant painting (painted by one of the roommates) you see above, along with the existing gold mirror dictated my color choices. 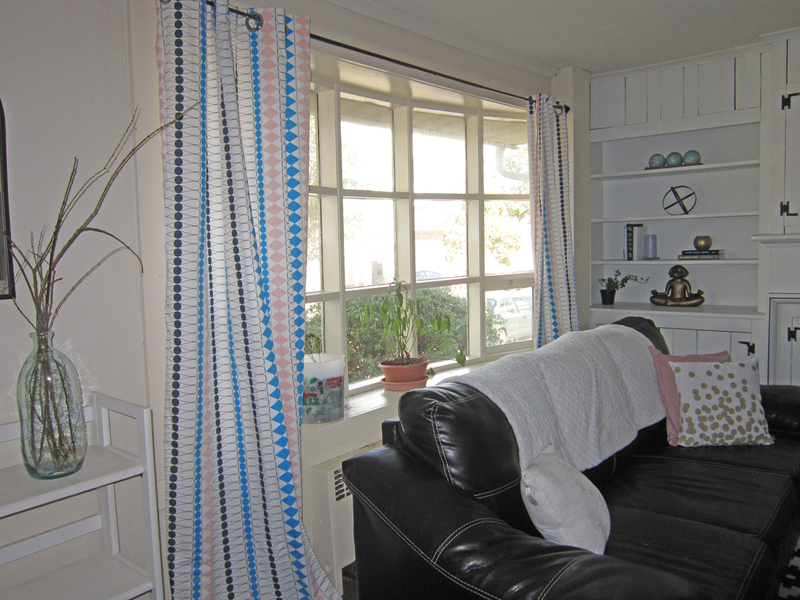 I pulled those colors throughout the room with the throw pillow covers, the curtains and the accessories on the shelves. The bay window wall before had green curtains that were too dark and too short. The photo below was taken on painting day, so it was very messy! I had also hauled baskets and boxes of the books for the fireplace this day. Did I mention there is never anywhere to park on this street? I hauled boxes of books and 7 ft rugs, painting supplies, and accessories for blocks every time I went there! I replaced those curtains with these lighter, brighter panels. They help tie all the colors in the room together. I love the gold dotted pillow* cover and it was under $8! I used pillow inserts I already had so I only had to purchase the covers. The blue and pink pillow covers are from H & M Home and were only around $5 each. How cute is the yoga dog on the shelf? He is from Pier 1 and I’ve had him awhile. He was in my daughter’s room at home, but he fits so perfect here! These bull horns are real. My daughter’s friend have given them to me because he knew I loved antlers and rustic decor. I never could find the right spot for them in my own house, but they work perfect here! And the rug. I just love it, it’s the perfect touch in here. I have to admit, I was kind of wishing I bought that for my own living room after seeing it in the space. The black blur on the rug you see in the next photo is the cat, Salem. The day I finished the design I was so excited. Is there such a thing as a designer’s high? Like a runner’s high? I’m thinking yes, and I had it that day! As for the other side of the room, here is the before. And after. Honestly, this little corner needs some tweaking but I ran out of time. I just want to point out again this is a rental house. If you happen to live in a rental, you do not have to spend a lot to make it more of a space that reflects your style! I spent a total of around $150 on the entire room makeover. All of these accessories, the rug, and the sofa’s can all be taken to my daughter’s next residence. Even if she will only be here for the next 18 months, they would have been very long months in the previous dark, depressing state! If you want more tips for decorating a rental, see this post. Decorating this room was part of the One Room Challenge started by Calling it Home, I’m sure there will be tons of amazing reveals from the other participants over there today! If you missed weeks 1-5, and you would like to see the progression of this room, you can catch up below. Week 5-The Sneak Peek has some after photos not included in this post! Your final room looks beautiful!! SO much brighter – the change in colour palate makes such a huge difference! Doesn’t it feel good to be past that finish line?! Thanks Lindi, yes it’s a relief to be finished! Now we all need a virtual drink! Thanks for sharing on My 2 Favorite things on Thursday!! Hope to see you again this week! Pinned! I’d have to say you nailed this challenge, turned out beautiful! Hi, Roxanne ~ I love how this room came out! It’s so bright and cheery! I especially love how you handled the fireplace. So creative. Congratulations on completing the ORC! Thanks Tiffany, this was my first one-room challenge but definitely not my last. I’ve already alerted my niece that her dining room will be crashed next spring! Roxanne, this turned out absolutely beautiful. So much brighter. Love everything about it. The rug, pillows and curtains look so good together. Fireplace wall is such a transformation from the drab to light and gorgeous. Great job. 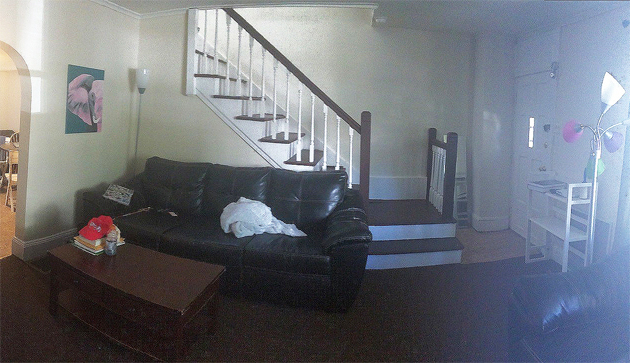 Placement of sofas is inviting. Thanks, Mom! <3 Your porch is on my makeover to-do list!! 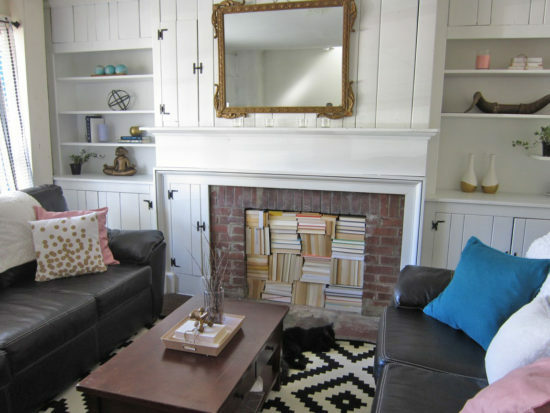 Your ‘new’ living room looks great and I LOVE the books in your fireplace! Oh my goodness! SUCH a transformation! It’s so light, bright and airy now!!! LOVE that fireplace too! GORG! Lucky girls! I am in love with the fireplace! It looks just beautiful! I love the fireplace, so fun! Love it, Roxanne! I need a yoga dog in my life! I hope your daughter enjoys and appreciates the new room. I would’ve loved a space like that when I was in school. Well done! It’s so bright and so much more modern looking! I love the books in the fireplace. What a great idea! Nice work! Congratulations on a job well done, Roxanne! I’m loving this transformation & can’t believe you did it in such a small budget! I love that rug too! This is beautiful! 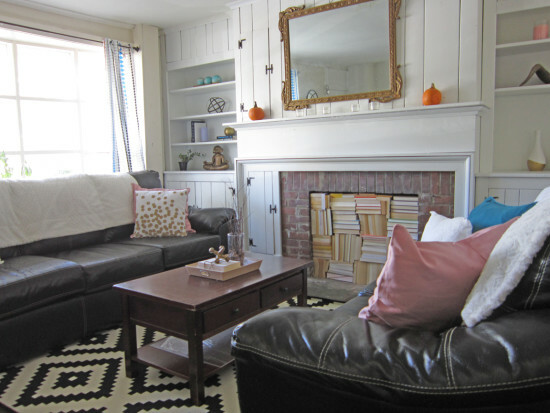 I love the painted wood panels, and that rug with the bright patterns works so well. This now feels like a bigger room and so relaxing. Wowee!! What a makeover! The white paint makes a huge difference!! It looks great and what a fun place for the girls to hang out! This is AMAZING! What a difference, I love it! Nice work!! It looks beautiful, I love how light and bright and the books in the fireplace are cool! 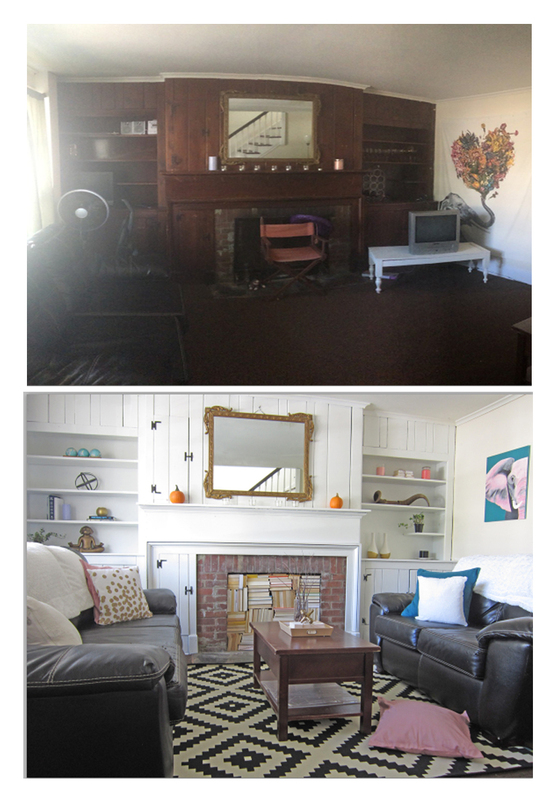 I love how you transformed the space so effortlessly (and on such a tight budget)! It’s amazing what a different a coat of paint makes. And I love how the books turned out in the fireplace! Thanks, Kevin-I love what you did with your room for the challenge too! WOW!! What a makeover! It’s crazy how much of a difference it makes paint those built ins white! So open and bright. I’m sure the girl’s love their new space. I just bought that rug too for my daughter’s play room. I love adding a pop of black in every room. Well done!!!!! 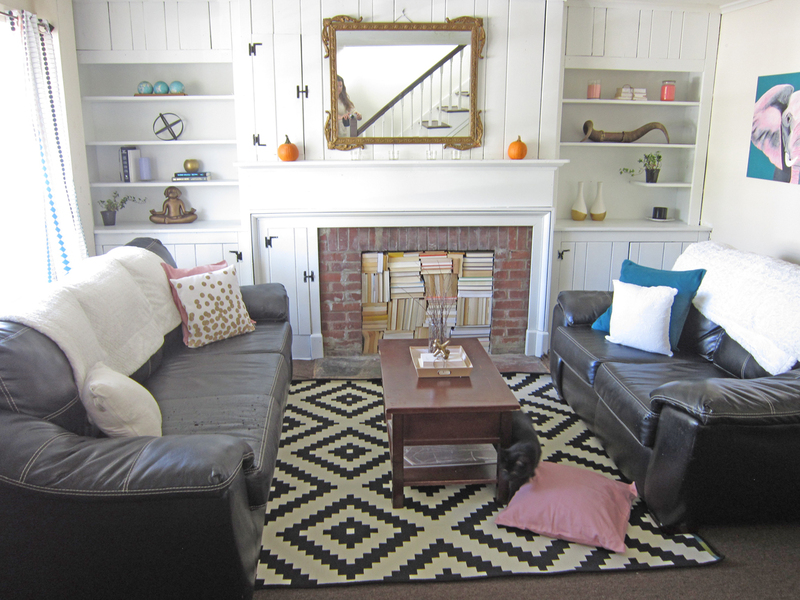 Thanks Sara, I’m in love with that rug, and it’s such a bargain! Great transformation! so fresh and udpated! enjoy your new space! I’ve been looking forward to see what you would do with that dark room, and you sure impressed me! The room looks amazing!! It goes to show what a little paint and some well chosen accessories can do to a space. You certainly don’t need to spend a fortunate to bring a space to life, and you are proof of that. AMAZING job! Jenny, thanks for your thoughtful comment! I am pretty proud of how it all turned out! Wow, such a drastic before/after. Love the books in the fireplace and the plant corner. Great job. Oh I wish I had a fireplace! I love your idea for filling it with books! Awesome! And that mirror is the stuff my dreams are made of- love it! This room look 1,000x better than it did! The white paint made a world of difference, and I just love, love, love those books in the fireplace. You did such an amazing job with such a small budget! I am SO impressed! Great job and you only spent around $150? I am so impressed. It has brightened up the room so much and I love all the fun decor. Congrats! Oh my goodness it doesn’t look like the same room! It’s so fresh and lovely now! Thanks for sharing it over at our inaugural “Inspired by You” link party! 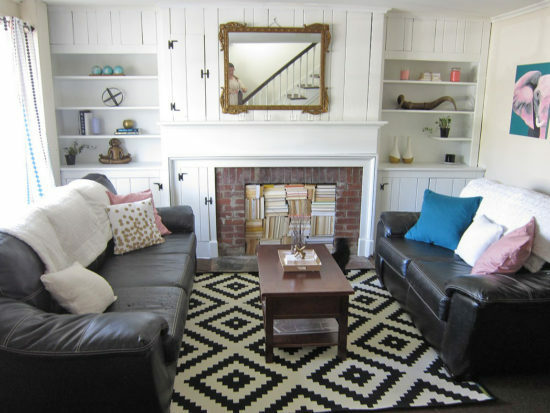 Roxanne it looks fabulous so bright and airy now but still cosy – love it especially the fireplace idea and the whitewood work. Wow, what a transformation. Not only does the coat of white paint brighten the room, but it really enhances the wood and it’s beautiful! 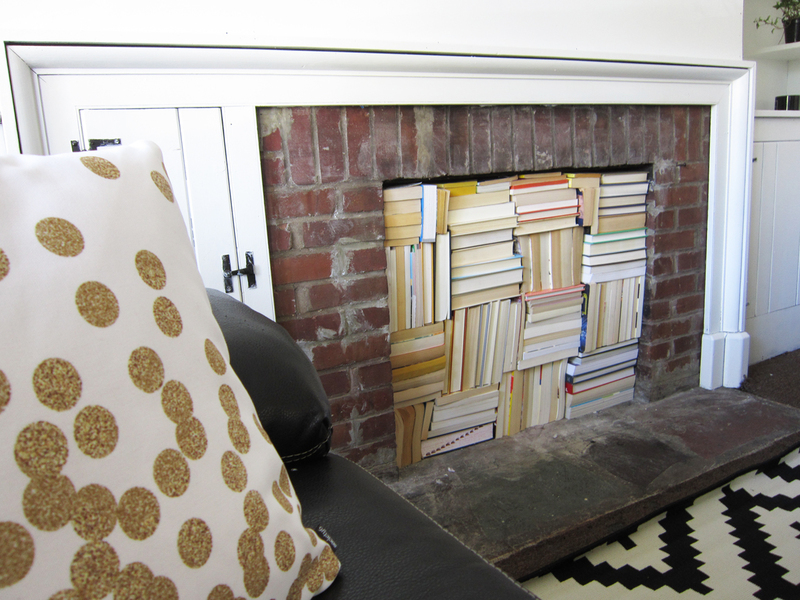 The books in the fireplace are a cute idea too. Thanks for sharing at Inspired by You link party. Please join us again next Sunday at 10:00 am EST. I love the bright white paint that you used. I agree, transformation is huge just from that. I also love the books in the fireplace…brilliant! Only touches I would have added are cozier throws on the sofas, maybe a painting of the brick on the fireplace (if owners allowed), and maybe some wallpaper or painted backs on the bookshelves…that would really make the room “pop”! The only thing I didn’t care for was the drapes. I think a solid color with some bamboo or wood blinds would have looked nicer…just my opinion though. Otherwise, what lucky girls they are to have you do this for them! I love what you did with the books in the fireplace! Such a unique idea. Your daughter is lucky that her mom is so loving and talented! You’ve created a wonderful space for the entire household! Totally agree that you DON’T have to spend a fortune to “freshen” your space and make it beautiful. Love everything you did and I think you need to return to the store and see if you can get yourself one of those rugs! Thanks Christine. 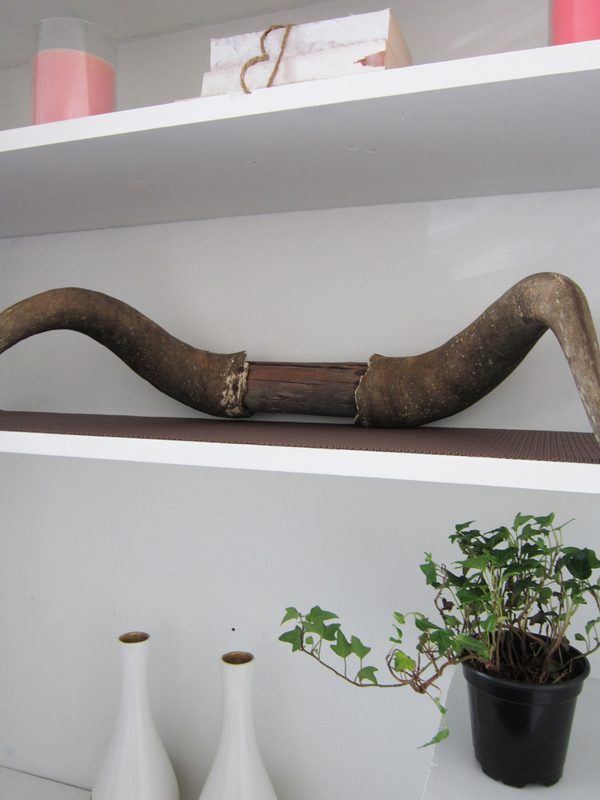 The wood on the bookshelves are actually real bull horns that a friend have given to me! Looks so nice; it’s amazing what a little paint can do. Well done on the makeover. The room is definitely a brighter and I would say happier place to be in! It’s amazing what a fresh coat of paint will do. I bet your daughters roommates are ecstatic about the change as well. I am really enjoying the plants in the corner. Thanks for sharing this transformation with everyone at Talented Tuesday. Hope you have a happy Thanksgiving! Huge transformation. I love the books in the fireplace. This is fresh and feels so much larger. Great job. WOW….that is what I call a makeover! Using paint is always a game changer and especially in this case. Great job and I bet the girls are thrilled! Oh yes….those books in the FP was brilliant! What an amazing difference paint makes!! Love this. OMG, I love how you redid the room — it truly is a total transformation without throwing everything out and starting over from scratch. Only goes to show you can never go wrong with classic black and white. The new seating arrangement brings the conversation area right to the focal point of the fireplace wall while leaving the entrance, staircase and entrance into the next room in the clear for easy traffic flow. I’m not particularly a fan of the elephant painting, but I love how you coordinated it and the mirror to introduce needed pops of color and a little bit of shine and bling. What a wonderful room — if it were my college house I’d be hanging out in the room all the time! 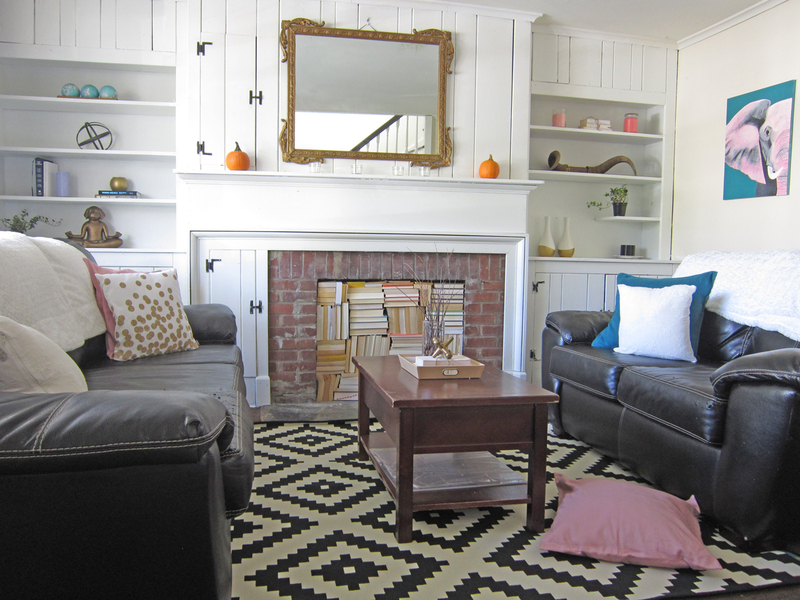 Oh my gosh, this is a great makeover! I wish I had something as beautiful to live in when I was in college. I’m sure the girls are loving it! Thank you for sharing this with us at the Your Home Decor & More Link Party #2! Wow… I can’t believe how different and GREAT that room looks! Lucky girls for sure! My favorite things of course are the books in the fireplace and the corner with all the plants… it’s very boho! Unbelievable transformation!! Love it! Thanks for sharing it at the DIY Challenge! 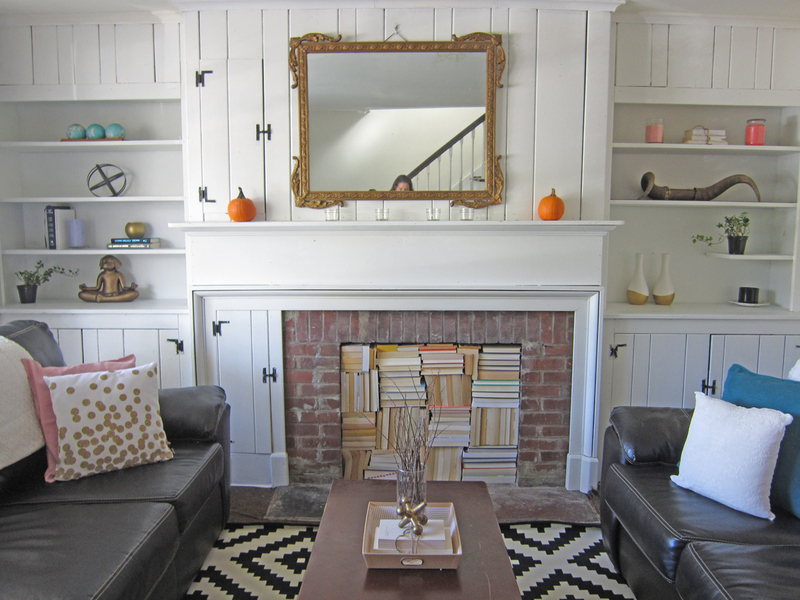 What a transformation…So Light and Bright and I adore the look of the books in the fireplace. Totally beautiful, paint can make such a difference. I love the books in the fireplace, you did such an excellent job making a dark and dreary room lovely and inviting. I’m sure the girls love it. Wow,you did a fantastic job! I would love to get your opinion for my living room. I moved here about a week ago and I would be on a limited budget. I sure hope you had approval to paint the wood paneling in this rental. If I was the owner, I would be outraged if done without approval. I love that you painted the tired, old wood, such an improvement. The floor plan works well! But, I really hate the mirror. It’s ugly and the scale is all wrong. I would have headed to Home Goods and found a large, fun canvas to bring in more color. It’s the focus of the space and needs to make a statement. Great, creative use of space and love the fresh young color palette. Just wondering where the tv ended up? That “problem corner” might have made a great spot with a little ingenuity. Thank you Moga, and the TV did eventually end up in that corner spot! 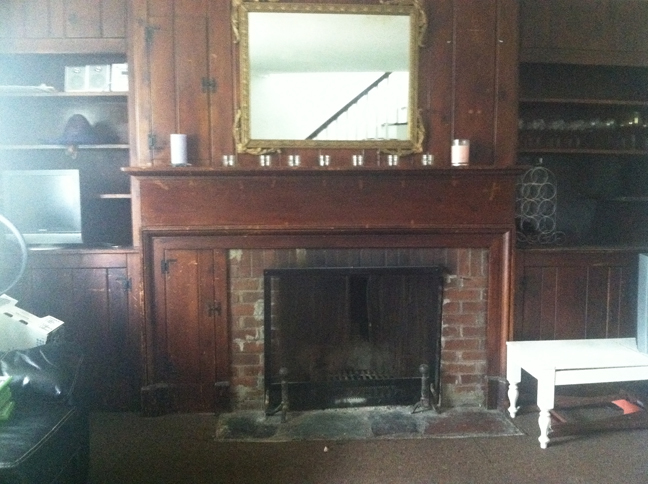 I think the fireplace is my favorite part! Thank you Rachel, the fireplace is my favorite part too! i did a similar makeover with my fireplace in my first ny apt . i painted my whole fireplace wall white too & since i couldnt use the fireplace either, i built a little bookshelf to place inside, & i put some of my beloved classics (binders facing out made it colorful too & i would reread them) on the 3 tier shelves ie. jane austin, shakespeare, f.scott fitzgerald…it made an interesting focal point & guests would often remark on it. then i’d get bored with it & replace it with fresh flowers or candles (done ad nauseum now) or i would decorate for the season..christmas, halloween, etc.. change is fun. enjoyed seeing your ideas. I love all of those ideas, thanks for sharing! My only regret with this project was that I didn’t do it in my own house!